WASHINGTON (CNN) -- President Bush rejected several Israeli requests last year for weapons and permission for a potential airstrike inside Iran, the author of an investigative report told CNN. 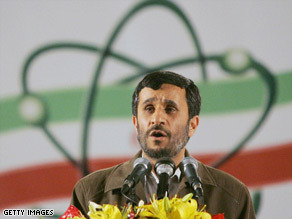 President Mahmoud Ahmadinejad insists Iran's nuclear program is only intended for peaceful purposes. Israel approached the White House in early 2008 with three requests for an attack on Iran's main nuclear complex, said New York Times reporter David Sanger. His article appears in the newspaper on Sunday. According to Sanger, Israel wanted specialized bunker-busting bombs, equipment to help refuel planes making flights into Iran and permission to fly over Iraq to reach the major nuclear complex at Natanz, the site of Iran's only known uranium enrichment plant. The White House "deflected" the first two requests and denied the last, Sanger said. Bush, instead, persuaded Israeli officials to not proceed with the attack by sharing with them some details of covert U.S. operations aimed at sabotaging Iran's nuclear ambitions, Sanger said. The ongoing operations are designed to undermine Iran's ability to produce weapons-grade fuel and designs it needs to produce a workable nuclear weapon, the newspaper said. "We know that the U.S. has been trying to conduct covert industrial espionage, if you will, against Iran's nuclear program for many years," said CNN's Pentagon Correspondent Barbara Starr. "[They have been] going to the suppliers, going other places; trying to make sure that things get messed up, if you will; that parts may not be what they should be; that certain processes may not work right. Anything that they can do to jam the work to delay the program." Sanger said he based his report on conversations with intelligence officials, none of whom would speak on the record because of the topic's sensitivity. "I suspect the Bush administration probably isn't going to comment very much on the details of this story, given the nature of this kind of intelligence operation and the sensitivity of the relationship with Israel," he said. Sanger said President-elect Barack Obama, who said during the campaign he wants to engage in dialogue with Iran, now inherits the operation. "He has got to figure out how to square the circle of having direct talks with the country while these are going on, or he could elect, I imagine, to modify this program or suspend it," Sanger said. In his first post-election news conference, Obama said a nuclear-armed Iran would be "unacceptable." He also said he would help mount an international effort to prevent it from happening. Iran maintains its nuclear program is for energy purposes only. It has been engaged in an escalating war of words with Israel, whom it accuses of trying to destabilize the republic. Israel has said it will not rule out military action to halt Iran's nuclear aspirations.